During the time of Ezra and Nehemiah in the Bible and even the Book of Esther, we can find some very complex issues that were dealt with by the Hebrew people. The books in the Bible devoted to those historical events are named for these brave and mighty men and women. Since the history is so closely related, and even overlapped, this overview and summary of the Books of Ezra and Nehemiah are offered together. In Hebrew manuscripts you will find these two books recorded as one. Time Written: Sometime after the fall of Babylon until the 2nd half of the 5th century. Most likely 538-432 B.C. Main Theme of the Book of Ezra: The return of the Jews from captivity in Babylon and the rebuilding of the temple. Ezra is also responsible for leading the Jews back to proper behavior and worship of the God of Israel, though this is not really complete until the last chapter of Nehemiah. 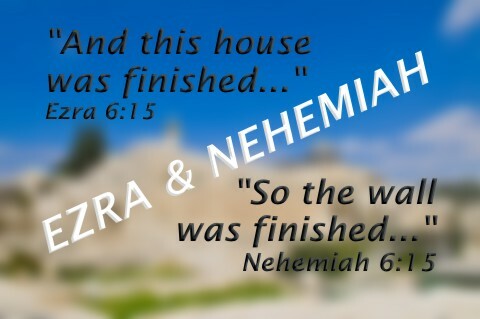 Main Theme of the Book of Nehemiah: Nehemiah’s primary mission was the rebuilding of the walls of Jerusalem. Secondary mission: social and religious reform. Chapter 4 – The people offer to help build the temple but they are not allowed and this causes them to become violent — the work on the temple is put on hold. Chapter 6 – The temple is finished and dedicated. Old rituals are observed in the temple. Chapter 8 – Chronicle of the names of Ezra’s company returning to Jerusalem. Of particular note is how Ezra calls upon the LORD to protect them as they carry valuables through dangerous places on the journey. Chapter 9 -10 – Ezra confesses for the people to the LORD. The people begin social reform. Chapter 2 – Nehemiah seeks permission from the King to rebuild the wall. He is laughed at by some whom he thought to be his friends. Chapter 3 – Nehemiah enlists the help of all classes of people to rebuild the wall. Chapter 4 – Nehemiah continues the project and overcomes wrath and contempt, conspiracy and the continued discouragement of friends by placing his trust in God. Chapter 5 – Nehemiah rebukes the people for being selfish and full of greed and shows them his own example of sacrifice that they might follow in his way. Chapter 6 – Even though some conspired against Nehemiah the wall is completed and the enemies are astounded that it was even possible. Chapter 7 – A recap of the genealogy register of those who came up from Babylonian captivity and the gifts given. Chapter 9 – 10 – The people confess their sins to the LORD and make a covenant to obey God’s laws. This marks the beginning of the return of the nation of Israel to the God who delivered them from their enemies. Despite much opposition and discouragement Ezra and Nehemiah overcame obstacle after obstacle to finish the missions that God had given them. Because of their strong leadership skills, prayer, hard work, steadfast courage and even self-sacrificing examples, God saved the Jewish people from captivity in Babylon and restored their city in Jerusalem. Something I noticed during my study of these two books is that in chapter 6 and verse 15 of each book the completion is recorded. Ezra and Nehemiah and their history are great examples of how the Lord can use anyone to do anything, even bring a disobedient and ungrateful people back to the One True God. Previous post: What Is The Torah?